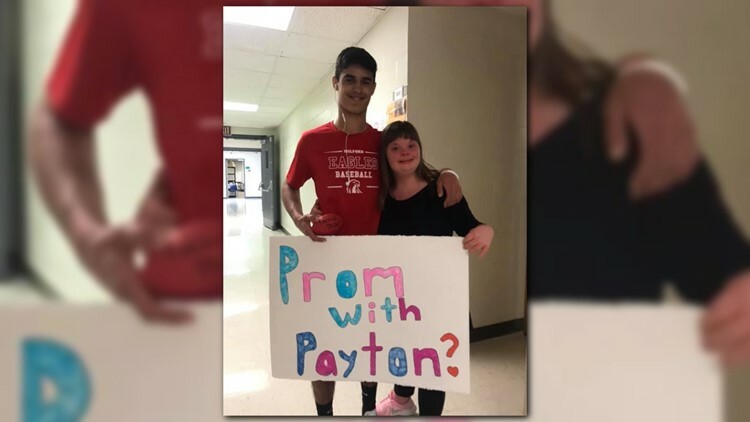 Katie Smith, an Ohio high school student with Down syndrome, surprised her friend Payton with a promposal that's warming thousands of hearts online. In a video posted by Andrea Bauer, Payton's mom and school secretary, Katie approached Payton in class with a sign that said "Prom with Payton?" Katie was joined by Kaylee Bauer, Payton's sister, who helped her coordinate the surprise. When he saw the sign, Payton said yes and gave his friend a hug, to the applause of his classmates. Katie teared up at his reaction. The two, who are both students at Milford High School, have known each other for two years. "Payton is super excited to make this a special evening Katie will always remember," Andrea said in a message.